Artistas Diversos is a nonprofit organization founded by the European Institute for Managing Diversity to promote the social and professional inclusion of persons with disabilities through the arts. Artistas Diversos represents artists of all ages and offers them a virtual platform from which to show their work with the hope of promoting employability and professional positioning of these artists without any discrimination. Artistas Diversos also hosts live exhibits. 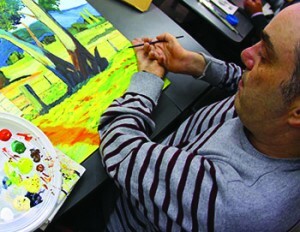 In July 2014, artists displayed their work at the Disability and Employment Fair in Barcelona for an audience of jobseekers and representatives of corporations, national administrations, and foundations. by Provital Group, a global company headquartered in Barcelona that specializes in the sales and production of ingredients and actives for the cosmetic industry. Provital’s sponsorship of the exhibits began as an employee initiative and, while it will only be open to Spanish artists in 2014, the company has plans to expand the exhibits to every country in which it has a presence, including Germany, France, Mexico, Brazil, China and the USA. For more information on Artistas Diversos and the corporate sponsorship opportunities available, visit artistasdiversos.org.